How much gasoline can be purchased with minimum wage in various countries? We’ve left 2018 behind which was a year in which the depreciation of Turkish Lira reached an all-time high. It is clear that the developments such as the spike in the exchange rate of dollar which peaked with 7.11 TL on August 13, 2018, and the newly-increased double-digit inflation which was fixed on the 24-25 percent band made our lives more expensive and affected purchasing power. In parallel with this, the increased gasoline prices have frequently been discussed on social media. Some posts compared the gasoline prices and gasoline taxes in Turkey with those in other countries. As teyit org, we analyzed several claims about purchasing power and taxation which were sent to us and shared widely on social media. The claim which made impression the most is a video that was uploaded to a Facebook page called “Naklen Haberler Life” on June 20, 2018. It was viewed over 3.2 million times and shared by over 41,000 users. In the video, it was claimed by Umut Oğuz that the price of gasoline per liter was 1.19 Euro at that time in Spain where minimum wage is 858 Euro, so a gasoline tank with 32-liter capacity could be filled 22 times with the minimum wage in Spain whereas the minimum wage in Turkey fills this tank only eight times. To show the figures in liter instead of gasoline tank, 715 liters of gasoline could be purchased based on the gasoline price in the video in Spain where gross minimum wage is 858 Euro in 2018. Considering that the price of gasoline per liter was 1.32 Euro on November 11, 2018, the quantity of gasoline which can be bought with the minimum wage decreases to 650 liters. As of November 20, 2018, 317 liters of gasoline could be purchased with the gross minimum wage which was 2,020 Turkish lira. This quantity is less than half of the quantity of gasoline that a Spanish citizen who receives minimum wage can buy. Therefore, it can be said that the discrepancy mentioned by Umut Oğuz in the video is true. 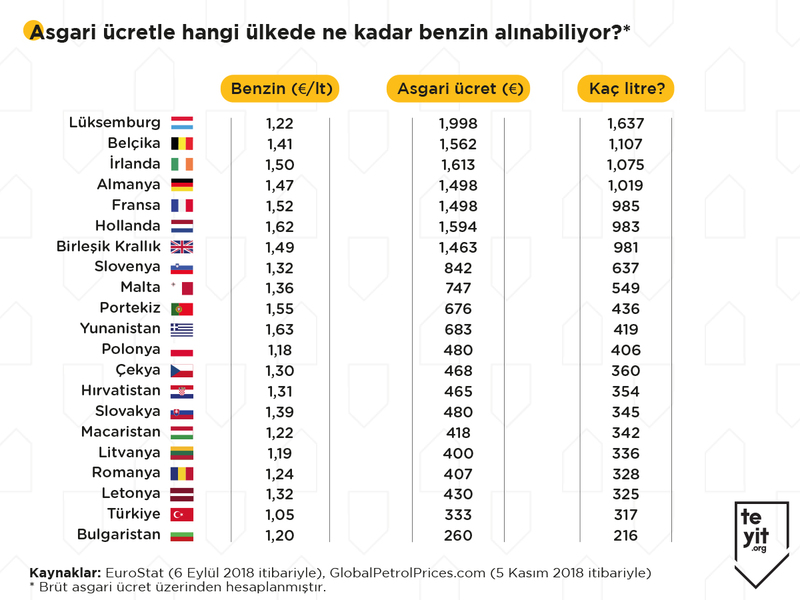 In line with this claim, we compared the gasoline prices in various EU (European Union) member countries with the gasoline prices in Turkey based on the gross minimum wage data taken from OECD and EuroStat. Information about net minimum wage in several countries are not gathered by a reliable source, so we prefer using the data of OECD and EuroStat which contain information about gross minimum wage. Even though the difference between gross minimum wage and net minimum wage changes depending on the country, it may give an idea regarding purchasing power. The comparison covers Turkey and 20 EU member countries where an official minimum wage is applied. These countries are divided into two groups which sell gasoline at a high price and at a low price. The countries such as Italy, Cyprus, Finland, Norway, Iceland, Denmark and Sweden which do not apply official minimum wage were excluded from our comparison. How much gasoline can be purchased with minimum wage? Gasoline (€/l), Minimum wage (€), How many liters? As seen in the list above, Turkey falls behind all of the EU member countries except Bulgaria with regard to the purchasing power of minimum wage for gasoline. In particular, it can be understood that at least three times more gasoline can be bought with the gross minimum wage in prosperous countries such as the Netherlands, France, Ireland, the United Kingdom, Germany, Belgium and Luxembourg than in Turkey. Bloomberg conducted a study called “the real cost of filling up” to measure the affordability of gasoline. The average daily income spent for gasoline was calculated in this study which compared 61 countries. 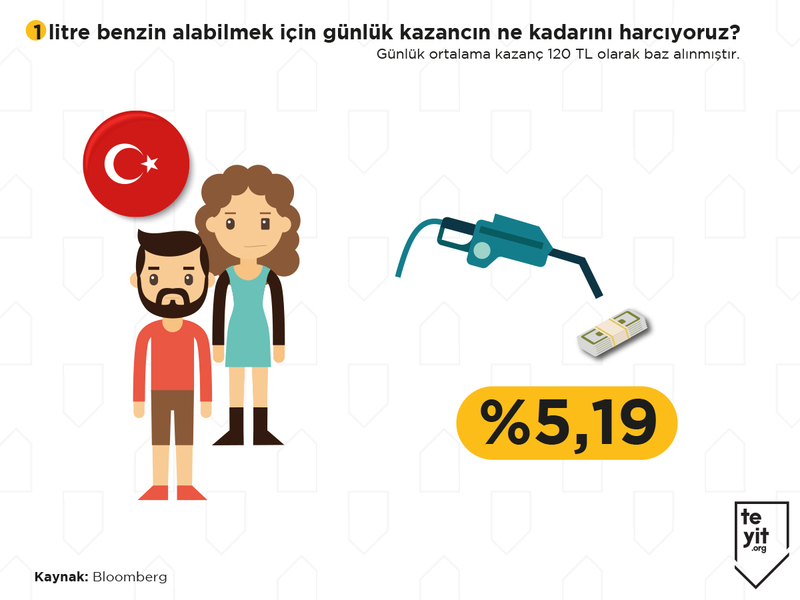 According to the study, a Turkish citizen should pay 5.19 percent of his/her average daily income (calculated as 120.85 Turkish lira) to afford a liter of gas. This figure makes Turkey rank 52nd among 61 countries with regard to affordability of gasoline. How much of our daily income do we spend to afford 1 liter of gas? 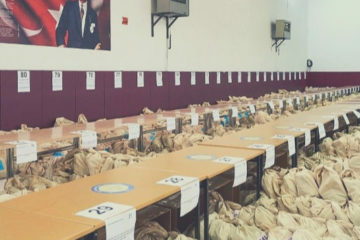 Average daily income was calculated as 120 Turkish lira. 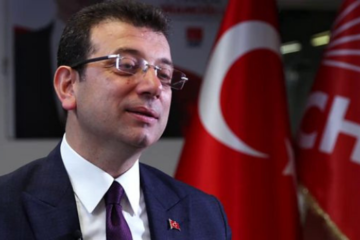 All of these calculations clarify the claim of the Minister of Energy and Natural Resources, Fatih Dönmez which has been recently notified to teyit.org that the cheapest gasoline of Europe is found in Turkey. 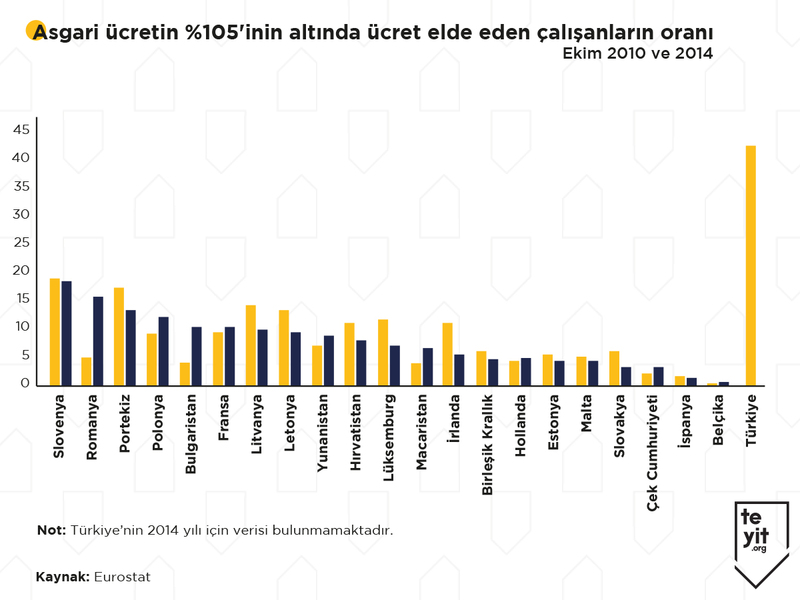 It can be said that gasoline in Turkey is far behind the EU member countries in terms of affordability although the price of gasoline in Turkey became lower than that in the EU member countries due to the devaluation of Turkish lira. Doğruluk Payı, a fact-checking website which evaluates the accuracy of politicians’ statements wrote an analysis about Dönmez’s statement. In the analysis, the website reached a conclusion that gasoline is expensive when the purchasing power is considered. 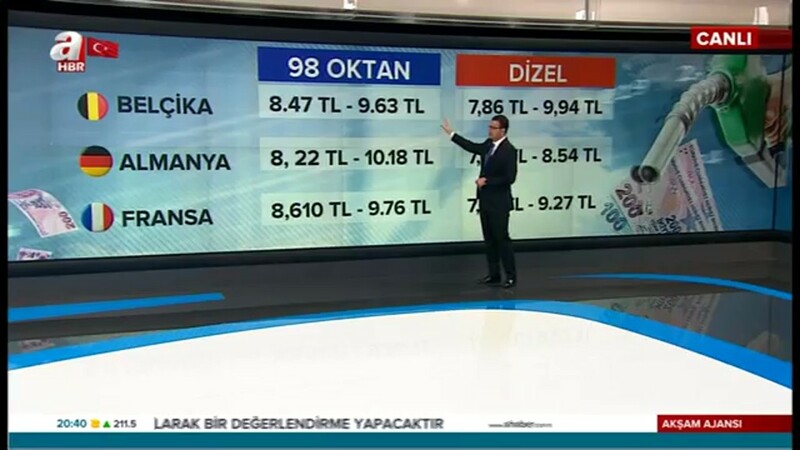 The increase in gasoline prices in Belgium, Germany, and France was discussed in a TV program called “Akşam Ajansı” on November 20, 2018, in the news channel, A Haber. 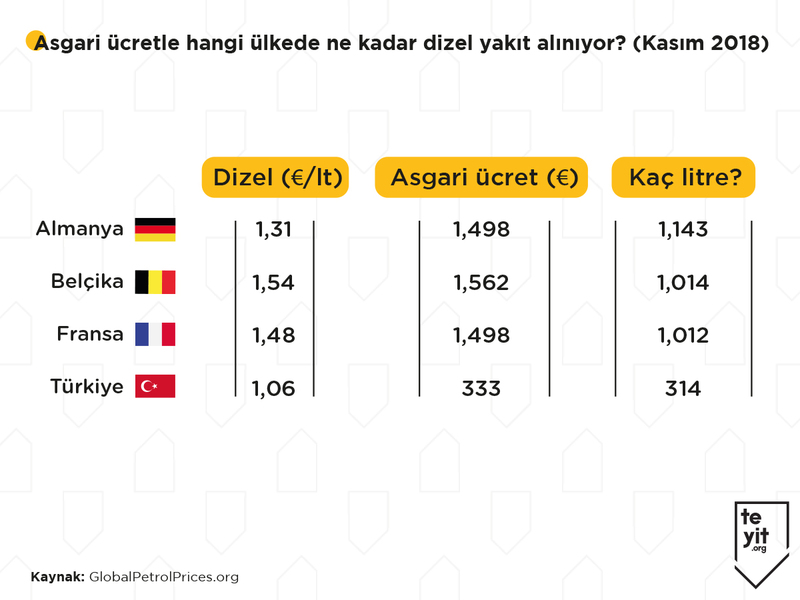 It can be said that the table which showed the rise of diesel prices in Turkish lira in the program was in essence misleading. As mentioned above, purchasing power of these countries is higher than that of Turkey. Furthermore, any citizen of such countries who receive minimum wage can buy three times more gasoline than a Turkish citizen who is paid minimum wage. Liter price of diesel in Turkey is 1.06 Euro as of November 19, 2018. This price is quite lower than that in many European countries. Nevertheless, the difference between the quantity of diesel which a person can purchase with gross minimum wage in any European country and the quantity of diesel which a Turkish citizen can purchase with gross minimum wage is huge. Diesel (€/l), Minimum wage (€), How many liters? The data about the average rate of the people who are paid minimum wage in European countries can be found from Eurostat. Note: 2014 data about Turkey is not available. It is claimed in another claim sent to teyit.org that 164 liters of gasoline can be purchased in Venezuela with the money spent for 1 liter of gasoline in Turkey. It can be seen that this claim has been circulating on the web since 2013. Venezuelan citizens were using the cheapest gasoline in 2013 while the most expensive gasoline was sold in Turkey during that time. In Turkey, 1 liter of gasoline cost approximately 2.6 US dollar on April 12, 2013, while its cost was 0.015 US dollar (1 gallon = 0.058 US dollar and 1 gallon = 3.78541 liter) in Venezuela. So the price of 1-liter gasoline in Turkey was almost equal to the price of 173-liter gasoline in Venezuela. Today, with also these devaluations of Turkish lira, the actual price of 1-liter gasoline is approximately 1.18 US dollar. On the other hand, in theory, 3.5 million liters of gasoline can be bought with only 1 US dollar in today’s Venezuela after the unusual devaluation of its currency, Bolivar. Therefore, it seems unlikely to deem Venezuela as a country for comparing gasoline prices as of 2018. Venezuela which holds about 20 percent of the gasoline reserves in the world ranks the first country. However, the country which suffers from a shortage of gasoline as well as the other consumer goods because of the current economic crisis struggles with abnormal hyperinflation. 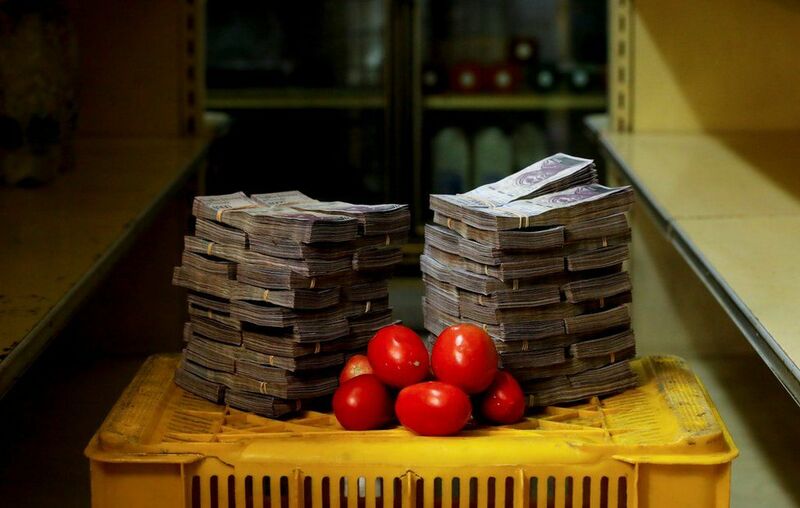 Reuters’ photographer Carlos Garcia Rawlins showed how Bolivar lost value in the country where inflation is 830,000 percent and the prices double every 26 days on average, with the photos of the daily consumer goods and the bank notes required to purchase them. 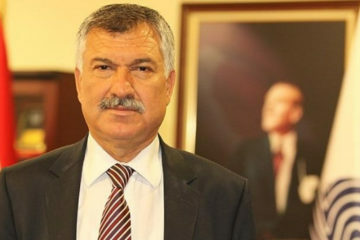 He graduated from the Law Faculty of Istanbul University. He is currently pursuing his masters degree in Political Science and International Relations at Boğaziçi University. His academic research interests include constitutionalism and judicial independence.